TE #87 Aaron Boesch – RS So., 6-foot-5, 230 pounds – After using his redshirt season last year, expect Boesch to see the field often in 2013. The athleticism and skills are there, but how much he plays will depend on the strength and size he is able to gain in the offseason. If he is able to get stronger and add 10-15 pounds, look for him to be a solid contributor on offense and special teams next year. TE David Wells – Fr., 6-foot-5, 230 pounds – True freshman rarely come in and play right away at San Diego State, but losing three players from a position group is just as rare. A three-star recruit, look for Wells to show up in fall camp and compete for playing time immediately next season. With an impressive skill set and a good combination of size and speed, Wells has a legitimate chance to make an impact as a true freshman. TE #85 Dominique Bierria – Jr., 6-foot-5, 215 pounds – A relatively unknown recruit, Bierria comes from Santa Monica City College and Carson High School in Los Angeles. At 6-foot-5, 215 pounds, he is a big target, but will need to add weight if he wants to play at the Division 1 level. Bierria will join the Aztecs in the spring and participate in spring practices, and his ability to join the team immediately will dramatically increase his chances of playing next season. Keep an eye on him throughout the offseason to track his progress. San Diego State has two tight end commits in the 2013 recruiting class. David Wells and junior college transfer Dominique Bierria are expected to sign with the Aztecs, and both will make a push for playing time next season. In the past, San Diego State’s offensive coordinators have relied heavily on two-tight end sets. With newly hired offensive coordinator Bob Toledo, it is unsure if this will be the case. Toledo plans to run a pro-style offensive, similar to what former offensive coordinators Andy Ludwig and Al Borges ran, but with three tight ends leaving, he will likely cater his play-calling tendencies to his strengths. While there is plenty of talent among the tight end group in 2013, experience is lacking, as Roberts is the only returning tight end who played last season. This will likely lead to fewer two-tight end formations and more sets with a fullback or a third wide receiver. 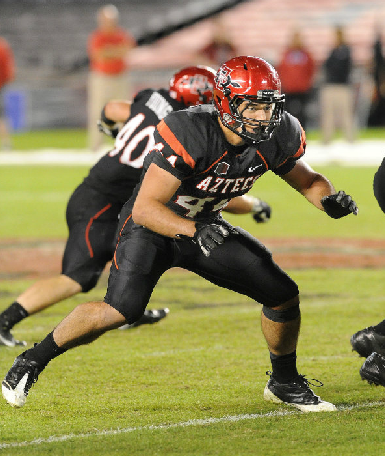 The Aztecs won’t abandon the tight end completely, however, as Roberts, Boesch and likely one or two others will see playing time next season. Expect Wells, Bierria, and redshirt junior Mike Miller to compete for playing time in fall camp. Also, don’t be surprised if the coaches flirt with the idea of moving former tight end and current defensive lineman Robert Craighead back to his original position. If this switch occurs, look for Craighead, a redshirt sophomore, to be in the mix for immediate playing time as well. One thing to keep an eye on is the involvement of Toledo with the tight ends from a coaching standpoint. Because it already has the maximum number of assistants, San Diego State will not be able to hire a tight ends coach once again in 2013. The Aztecs were able to get away with not having a designated tight ends coach in years past because of the depth and experience of the tight ends, but things will be different next season. Last season, Ludwig was listed as the tight ends coach and first-year graduate assistant Dorian Keller helped out with the position. With a young and inexperienced group, it is imperative that Toledo pays close attention to the tight ends throughout the offseason, as they will need his wisdom and expertise to progress and improve. Wells or Bierria will see significant playing time in their first season with the Aztecs in 2013. What about this new recruit Darryl Richards extremely athletic he along with ells gives us two outstanding athletes at tight end. He does seem to be a great athlete. I think Bierria will have a huge advantage though because he will be here for spring practices and workouts. After signing day, I will likely write a recap of the signees. Richards will be included in that. Most are incredible to have. If only We could produce Cheap Miu Miu Bags for Sale when it comes to anytime with no need of searching foolish! My favorite Christmas Carol has alwyas been Scrooge , the Albert Finney classic, until I viewed A Christmas Carol The Musical starring Kelsey Grammer. This movie is well directed, the performers are outstanding and the special effects are great. This is a must see for anyone who loves musicals. This movie is the closest to a live theatre production that you will ever experience.